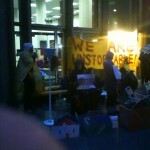 Of late, Occupy Wall St West has not been active. Until this changes, this website is in archive mode. Feel free to peruse the website, but please don’t expect a rapid response by filling out any of the forms or contacting Occupy Wall St West. Check out the photos just below or the links to more photos. Thanks for an Amazing Day of Actions! 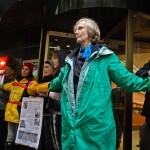 Thanks to everyone who contributed to such an amazing day of Occupy Wall St West actions yesterday, January 20, 2012. Onward! 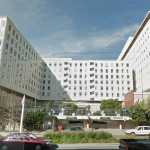 8:33pm — Please join your fellow Occupy SF activists by showing up for a Housewarming party at the Cathedral Hill Hotel, 1101 Van Ness Ave., San Francisco, CA 94109. Please come prepared! 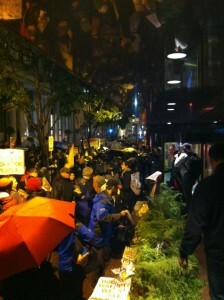 8:10pm — More than a hundred protestors have occupied the Cathedral Hill Hotel and are celebrating. Occupy SF General Assembly on the roof of the hotel. 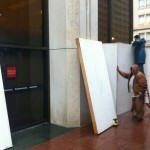 Occupy SF secured a vacant hotel to point out the injustice of homelessness while there is a vacant hotel. 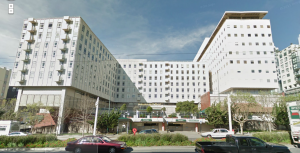 California Pacific Medical Center (CPMC) plans to demolish the building to construct a new hospital and apparently has no plans to treat Medicare patients and the 99% who can’t afford skyrocketing medical costs. 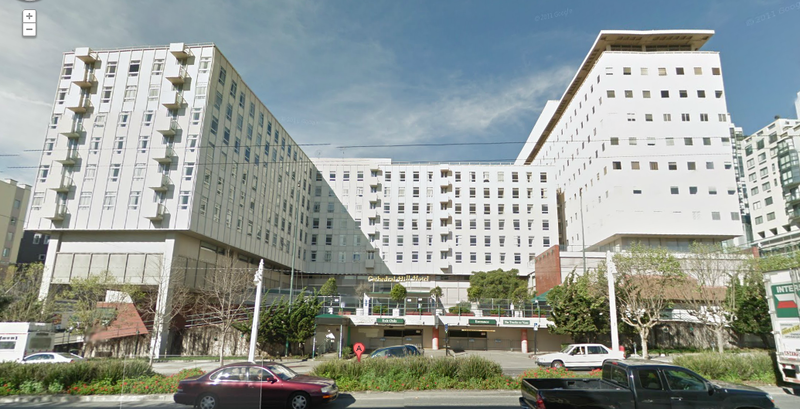 A daytime view of the 600-unit Cathedral Hill Hotel. 7:47pm — Protestors occupy Cathedral Hill Hotel at Franklin and Geary, which has been vacant and closed for years, although slated for conversion into a California Pacific Medical Center hospital. 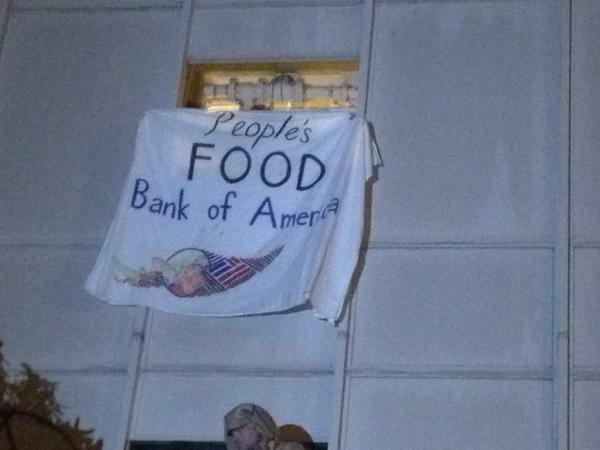 Protestors hung a banner which reads “People’s Food Bank of America”. 7:18pm — Black Bloc protestors smashed at least one window at Bentley luxury car store in violation of Occupy Wall St West action agreement which requires Occupy SF GA and/or Occupy SF Action Council consensus for use of property destruction at today’s actions. 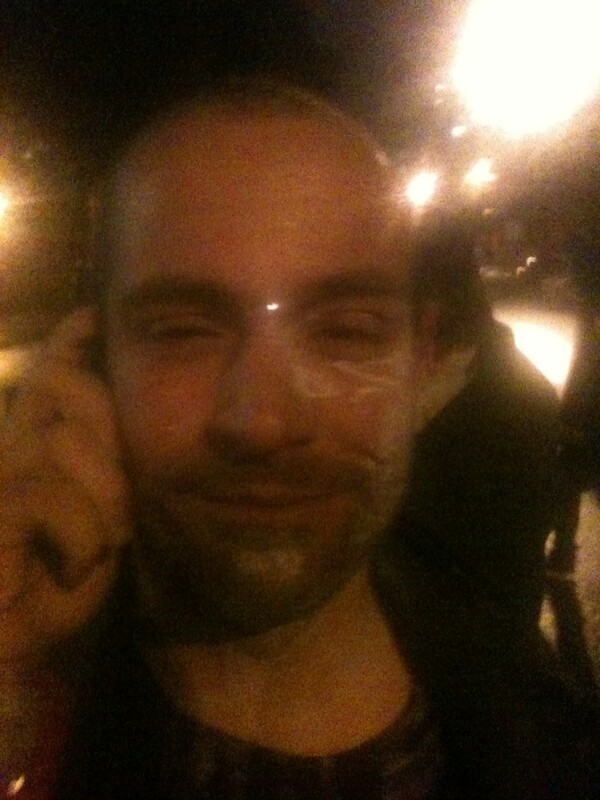 UPDATE 8:00pm — Occupy medics have treated the people who were pepper sprayed. 7:13pm — Riot cops have apparently sprayed at least twelve people with pepper spray and are beating protestors at Van Ness and Geary. Police reinforcements are arriving. 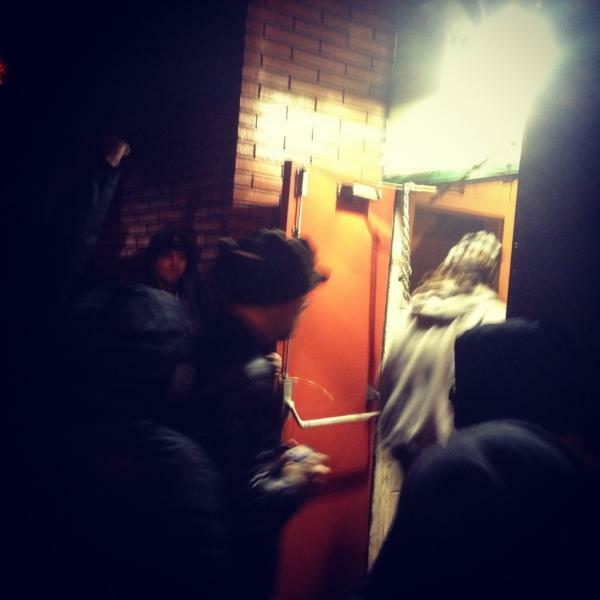 7:04pm — The march arrived to a phalanx of a hundred or more police near the target site. A row of riot cops with barricades behind them are blocking the entire road and thousands of protestors are shouting “Cops go home!”. 6:11pm — Speaker gives a shout out to all the groups represented at the day’s actions. 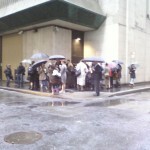 Lots of people turned out for a windy, rainy day. 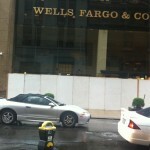 6:02pm — Wells Fargo boarded up a third bank at 1 Montgomery St (at Post). 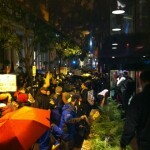 Protestors at Bank of America Unlock With Great Success! 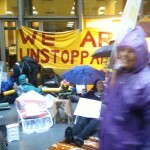 6:00pm — Occupy SF protestors who locked down to shut down the Bank of America headquarters at 345 Montgomery Street unlocked after bank hours to declare their action an amazing success. 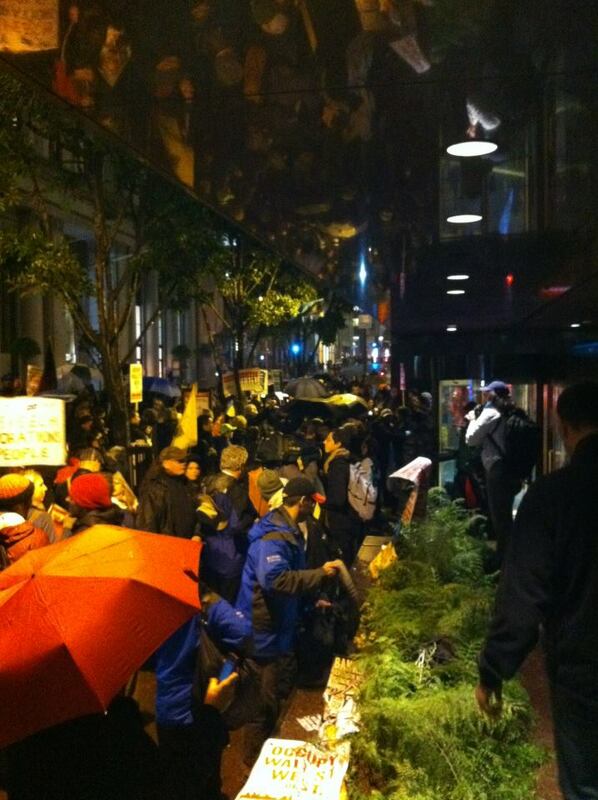 5:55pm — Occupy SF protestors marched from Bradley Manning (Justin Herman) Plaza to the Bank of America to rejoin protestors engaged in civil disobedience to shut down the bank for the last nine hours. 5:51pm UPDATE Occubus De-arrested! 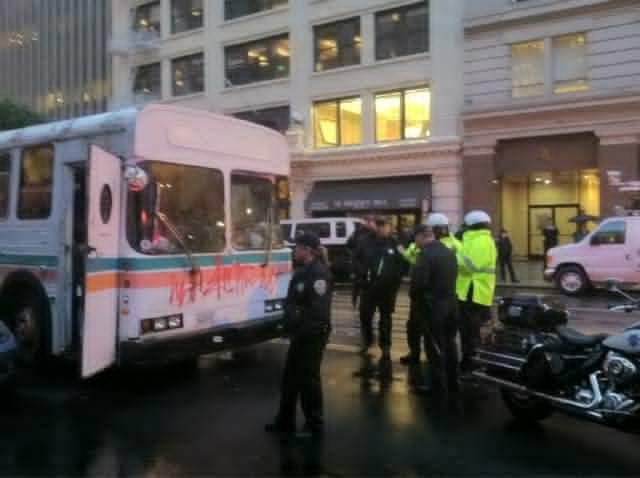 5:29m — Police stopped the Occupy Oakland Mobile Party Bus and searched it, then tried to stop and maybe tow the bus and charge the driver with a violation for a missing rear tail-light. The police may cite and detain those on the bus. 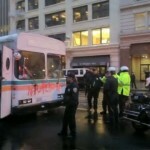 Occupy SF marchers surrounded the police and the bus to demand that the police go home, then continued down California Street. 4:52pm — The anti-labor practices of the Hyatt apparently caused the fountain at the Grand Hyatt at Union Square to spontaneously erupt in rabid bubbles that overwhelmed the hotel’s steps. For over 2 1/2 years, Hyatt workers have fought for fair contracts and workers at all three San Francisco Hyatts have called for boycotts of their own hotels. 4:37pm — Protestors occupied Fortress Investments today to demand a halt to predatory equity scams where landlords and banks buy apartment buildings intending to remove rent-controlled units from the market so they can replace them with market-rate tenants. Fortress is demolishing over 1,500 rent-controlled apartments in Parkmerced and has evicted hundreds of tenants. The protestors marched around the building and a fake bike messenger snuck in the building to deliver a demand letter to Fortress CEO Daniel Mudd telling him to stop demolition of rent-controlled apartments and halt evictions of tenants. 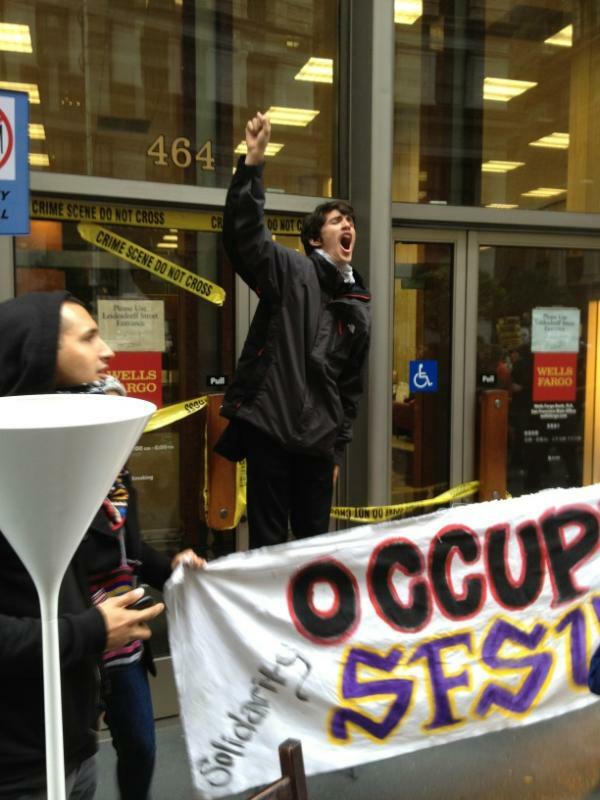 4:37pm — According to Occupy Legal, so far at this point in time, the police have arrested a total of approximately 20 people, almost all of whom were cited for misdemeanor trespassing in the morning at all four doors of Wells Fargo Headquarters and released. The police arrested one person for a more serious charge who is apparently already out on bail. 4:18pm — Protestors led by People Organized to Win Employment Rights (POWER) occupied busses running on Market and Mission Streets to demand free transportation for youth. 4:16pm — Wells Fargo at 1 California (at Drumm) followed the lead of Wells headquarters and built wooden barriers in front of the building that apparently prevent all access to ATMs and the building entrances. 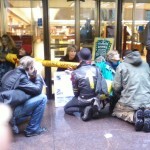 4:00pm — Protestors have succeeded in blocking doors at the Bank of America headquarters at 345 Montgomery Street for more than seven hours! 3:45pm — Protestors led by the Chinese Progressive Association of San Francisco occupied the Citi Apartments to fight for workers’ stolen wages!! 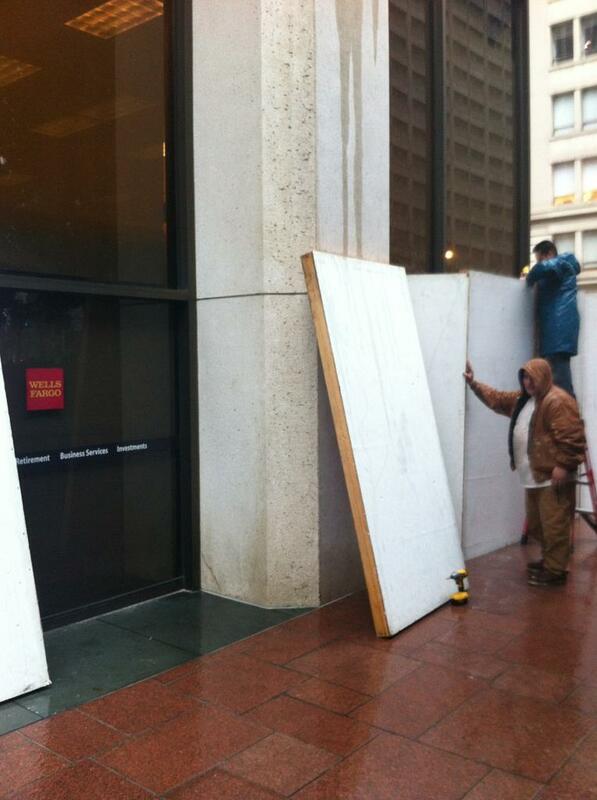 3:30pm — Wells Fargo headquarters at 420 Montgomery (at California) built wooden barriers in front of the building that apparently prevent all access to ATMs and the building entrances. 2:00pm — Occupy Bernal protestors are celebrating at City Hall their success in halting a foreclosure auction of neighbor Maria Davila’s property. 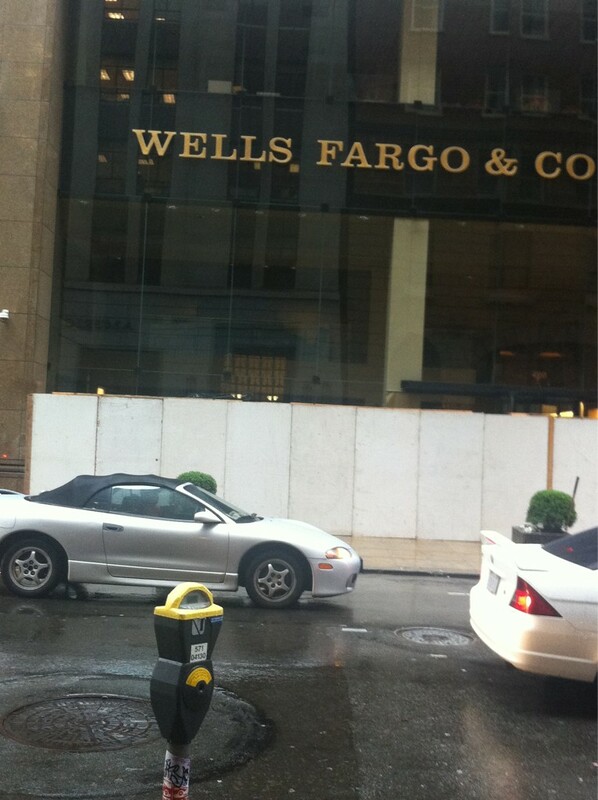 2:00pm — Riot police headed toward protestors at the Bank of America at California and Montgomery. 1:47pm — Some Wells Fargo customers, shocked by the treatment of Occupy protestors, decided to close their accounts at a downtown Wells Fargo branch. 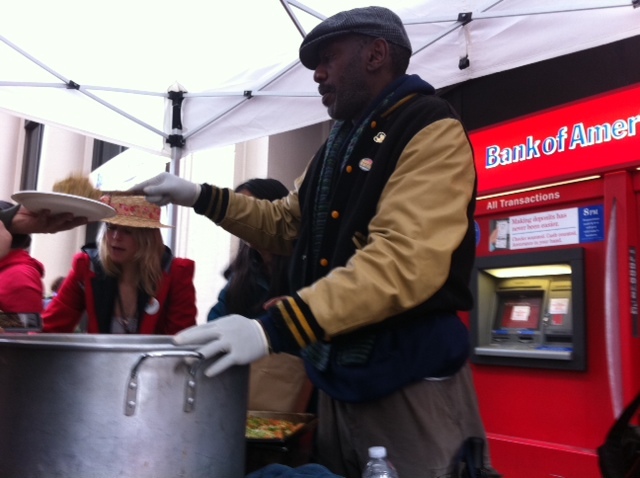 1:03pm — The Occupy SF Autonomous Action Workgroup transformed a bank at 1 Market Street into the People’s Food Bank of America and fed hundreds of hungry protestors with nutritious, organic food to show the community what could be there instead of the Bank of America. 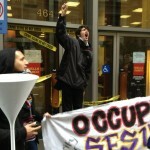 12:55pm — Live video of Occupy the Courts action. 12:43pm — More than six hundred protestors are marching from Fannie Mae to the Immigrations and Customs Enforcement (ICE) office at 630 Sansome to demand that ICE stop tearing families apart, stop deportations and destabilizing communities in the name of “natural security”. 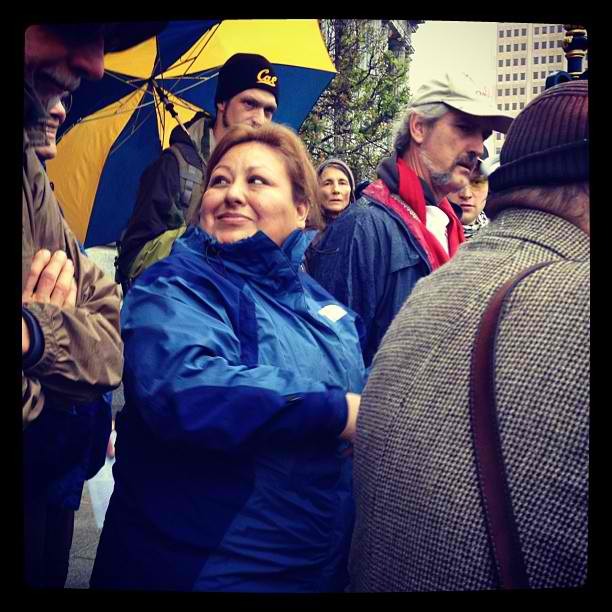 12:30pm — More than a hundred fifty protestors occupied the 9th Circuit Court of Appeals at 95 7th Street to demand a 28th amendment to the U.S. Constitution to end corporate personhood. 12:16pm — More than a hundred protestors occupied Fannie Mae at 55 California Street to stop evictions and foreclosures from predatory loan practices and to demand Fannie Mae turn over empty homes for affordable housing. 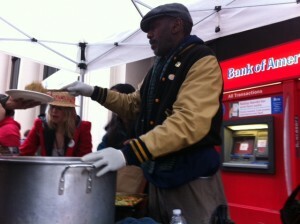 12:07pm — Food Bank of America is serving up meals at their new branch location at 1 Market Street. 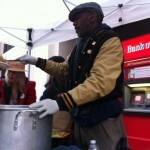 Bring deposits of canned food or non-perishables or just get fed! 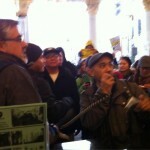 Flash Mob Gathering at 555 California. 12:02pm — A flash mob is gathering at 555 California… check it out! 11:21am — Human billboard and about 50 protestors at California Pacific Medical Center action at Van Ness Ave and Geary. 11:14am — Police hitting with batons and shoving protestors at California and Montgomery. 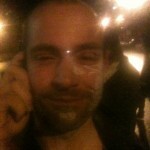 Police arrested videostreamer named Corey out of a crowd of approximately 250 protestors for unknown reason. 10:58am — Occupy Bernal is celebrating the postponement of an auction of a Wells Fargo home that two Bernal neighbors rent… w00t! 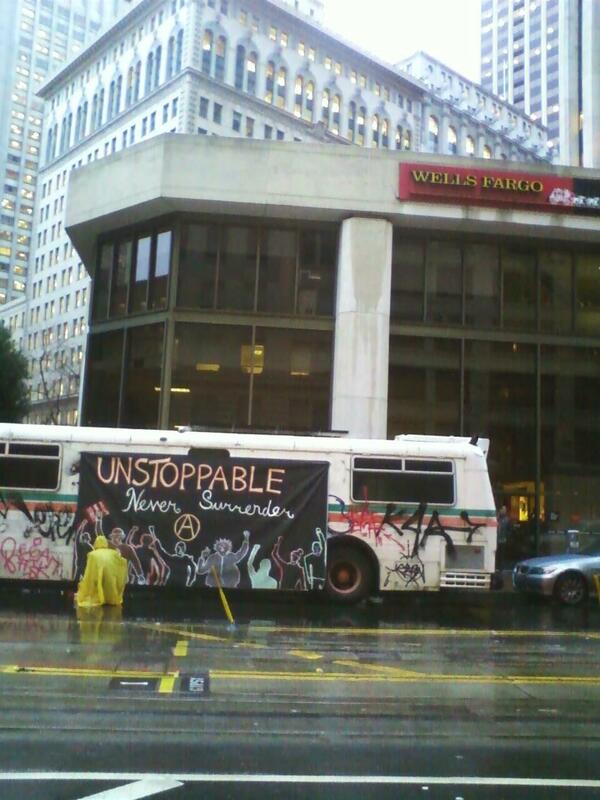 10:46am — 10 protestors have returned to block off access to Wells Fargo Headquarters entrance near Montgomery and California, arrests imminent. Mysterious amorphous black blob occupies San Francisco. Protestors staged an eviction of Citicorp at 1 Sansome Street. 10:11am — 45 Occupy Bernal protestors led by four families fighting eviction and foreclosure delivered demand letter and shut down Bank of America branch at 3250 Mission and 29th Streets, heading to Wells Fargo branch at 22nd and Mission Streets. 10:04am — Banner blocking intersection at Montgomery and California. 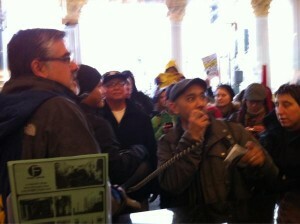 9:57am — Protestors take to the streets at Bank of America at 345 Montgomery. 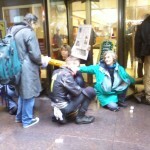 9:54am — Twenty to twenty-five protestors have gathered at the Bank of America branch at Powell and Market Streets. 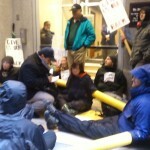 9:22am — Police Commander confirms seven arrests so far at Wells Fargo Headquarters entrance at 420 Montgomery. 9:22am — Police are blocking off access to Wells Fargo Headquarters entrance at 420 Montgomery and cutting protestors out of lock boxes to arrest them. 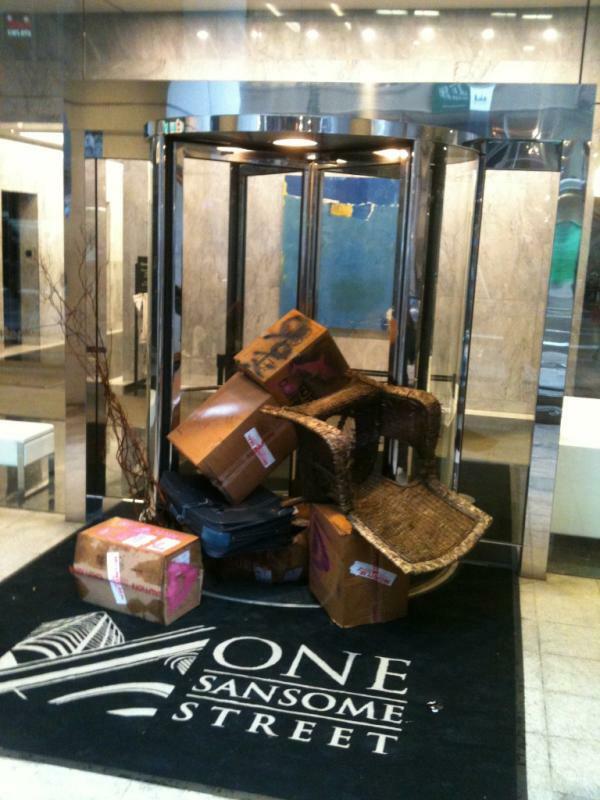 9:21am — Foreclosure house party with music and furniture at 7th and Sansome Sts. 8:50am — 40 protestors and some squids now blocking entrances at Code Pink action at Wells Fargo Headquarters, 420 Montgomery St (at California). 8:31am — Six people blocking entrance and five police guarding the ATM at 345 Montgomery Street Bank of America branch, 30 protestors there, need more. 8:30am — Police and firefighters have assembled intending to cut bolts and chains used to bind together at least 68 protestors performing civil disobedience by blocking entrances to Wells Fargo bank headquarters building at Montgomery and California Streets. 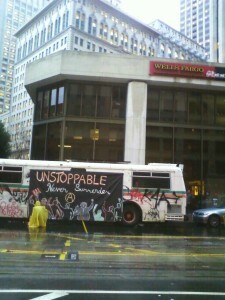 7:39am — Mobile party bus occupies Wells Fargo. 7:29am — Four activists at Bechtel, including Father Louis Vitale, 45 Beale St, are reading a list of charges against the corporation in the building lobby. 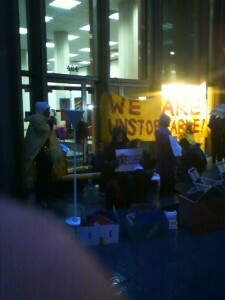 6:53am — About 30 Occupy Wall St West protestors have blocked five entrances of Wells Fargo Bank at 420 Montgomery Street (at California). 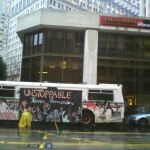 During the week of January 16th, the California Department of Corrections successfully apprehended, rehabilitated and discharged more than one dozen bus shelter advertisements (see photo below) throughout San Francisco, including the intersection of California and Davis Street, one block from the Federal Reserve Bank of San Francisco. 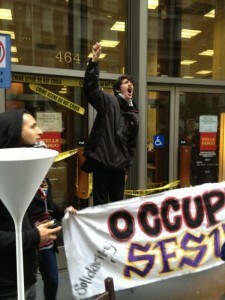 Activists dropped banners this morning to spread the word about the January 20, 2012, Occupy Wall St West actions. 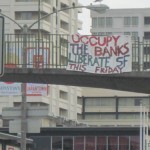 Two banners, one reading “Liberate SF, January 20th – Occupy the Banks” and one reading “Occupy the Banks, Liberate SF – This Friday” were hung by activists to spread the word about the shutdown of the Financial District this Friday. 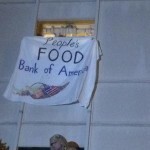 San Francisco – Occupy San Francisco activists plan to occupy San Francisco’s Financial District this Friday, January 20 (J20), to demand that banks end predatory evictions and foreclosures and that corporations lose the rights of personhood. 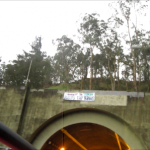 Protestors will target banks and corporations complicit in attacking Bay Area communities, homes, education, environment, livelihood, and democracy. The Occupy Movement will continue to build a strategic mass movement asserting the power of the 99% for economic justice and a better world. 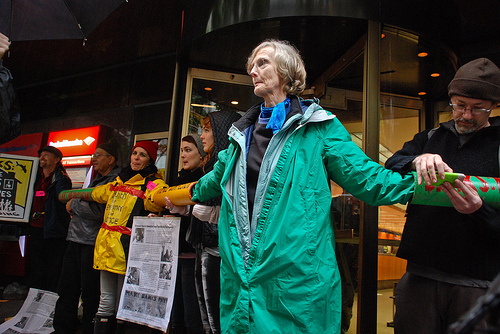 The J20 Wall Street West action kicks off 2012 with dozens of affinity groups (people self-organized into groups to participate in the occupation) and over 55 organizations targeting specific banks and corporations. Occupy Wall St West will be the largest occupation and street protest of the SF Financial District since anti-war mass nonviolent direct actions on March 20, 2003. WHAT: Daylong protests and direct actions to disrupt business as usual for banks and corporations complicit in evictions and foreclosures, economic injustice, war profiteering, and labor rights violations. 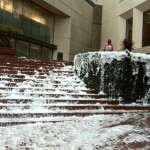 WHEN: 6:00am-7:00pm, January 20, 2012. The day kicks off with a 6:00am squid fry at Goldman Sachs, 555 California St, and culminates with a 5pm March from Bradley Manning (Justin Herman) Plaza to 555 California St. Press liaisons will be available from 6:00am to 6:00pm at Bradly Manning Plaza welcoming station to direct press inquiries. 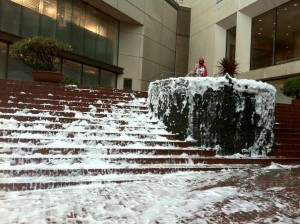 at Bradley Manning (Justin Herman) Plaza, San Francisco. 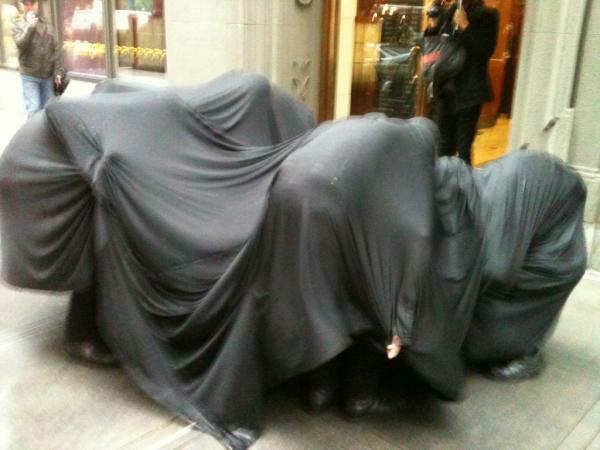 6:00am-11:30am: “Squidding Goldman Sachs” people in giant squid costumes – 555 California St. 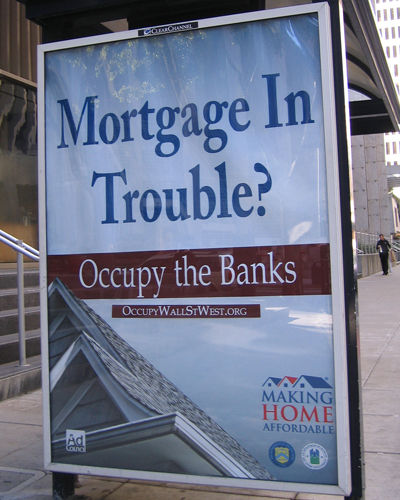 The January 20, 2012, Occupy Wall St West actions are the culmination of actions in which hundreds of protestors successfully shut down bank branches in the Excelsior, Mission, and Bernal neighborhoods. Over 50 additional organizations are participating in the Occupy Wall Street West Day of Action including: 28th Amendment Group, Ack-Act Theater, ANSWER (Act Now to Stop War and Racism Coalition), Alliance of Californians for Community Empowerment (ACCE), Asian Law Caucus, Bail Out the People Movement, Bay Area Labor Committee for Peace & Justice, California Nurses Association, Causa Justa: Just Cause, Coalition on Homelessness, Chinese Progressive Association, CODEPINK Women for Peace, Coleman Advocates for Children and Youth, Dancing Without Borders, Eviction Defense Collaborative, Filipino Community Center, Global Exchange, Greenaction for Health and Environmental Justice, Homonomixxx, Housing Rights Committee, International Action Center, International Socialist Organization, Iraq Veterans Against the War, Jewish Youth for Community Action, Jobs with Justice, La Raza Centro Legal­Day Laborer Program and Women’s Collective, Move to Amend, Move to Amend: Olympia, Mujeres Unidas y Activas, NationofChange, Occupy Bernal, Occupy Berkeley, Occupy MJC (Modesto Junior College), Occupy Oakland, Occupy SF General Assembly and Action Council, Occupy SF Housing Coalition, Occupy SFSU (San Francisco State University), Old Lesbians Organizing for Change, People Organized to Demand Environmental and Economic Rights, People Organized to Win Employment Rights, Pride at Work, Pride at Work/HAVOQ (Horizontal Alliance of Very Organized Queers), Progressive Workers Alliance, QUEEN, Rainforest Action Network, San Francisco for Democracy, San Francisco Labor Council, San Francisco Tenants Union, SF 99% Coalition, SF Gray Panthers, Seminary of the Street, SF Interfaith Allies of Occupy, SF-NOW, Workers World Party, Young Workers United. 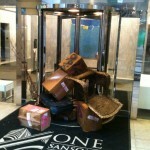 Just a little reminder of Friday’s big event. It sounds like there will be a lot of people joining us! Even if you can only make it for an hour you’ll bolster numbers. 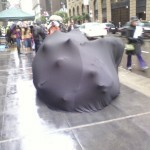 Take a look at the occupywallstwest.org site for more info or just show up and you should see people engaged in various forms of protest, performance, speaking out. You can start in Bradley Manning (Justin Herman) Plaza across from the Ferry Building where there will be orientation and a description of the various actions and their locations. At 6:00am, 12:00 noon, and 5:00pm there will be rallies which will then move out into the Financial District. It sounds like rain (too bad) so bring your cozy rain gear. If you can’t make it please send this on to friends or call me for posters for you window or flyers to hand around to anyone. At 10:00am this morning, January 18, 2012, Occupy Wall St West held a well-attended press conference with speeches and action announcements from a diverse group of affinity group and organizational representatives, including Iraq Veterans Against the War, Young Workers United, The Progressive Workers Alliance, Unite Here Local 2 Hotel and Restaurant Workers Union, California Nurses Association, Occupy SFSU (San Francisco State University), Alliance of Californians for Community Empowerment (ACCE), the Episcopalian Church, and the ANSWER Coalition. Videostream available here (please endure the advertisement to see the program).